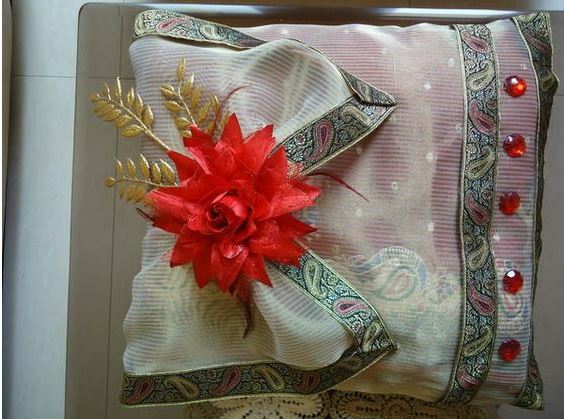 How to Do Saree Packing Decoration at Home? We women have a habit of saving money whenever and wherever we could. Though we apprehend the subject of Economics, but when it comes to matters related with managing money and making smart calculations, we love to adopt it as a habit. And occasions like weddings or baby showers are the best times when we can use our cognitive abilities to do little things like decorating our saree packages. 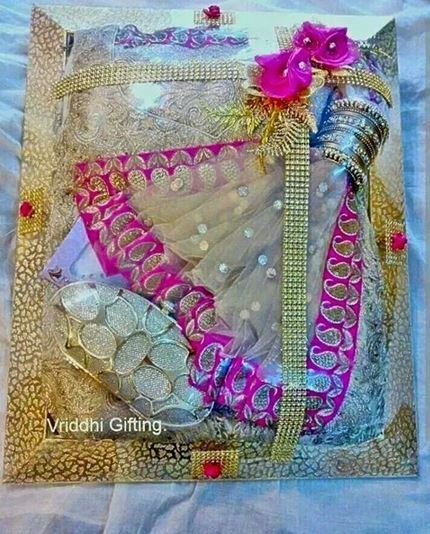 Saree packaging decoration can be done at home if we use our creativity well. Here are 5 interesting ideas for making your saree look better in the same old plastic wrap. 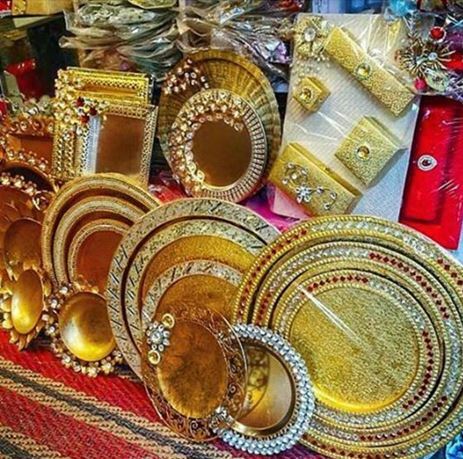 Just like we have trays for assembling dry fruits and other edible knick-knacks, you will also find large trays in decoration shops in which you can place your saree so that it looks amazingly best. Beautiful trays with interesting carvings and grand designs are available at every local decoration shop. 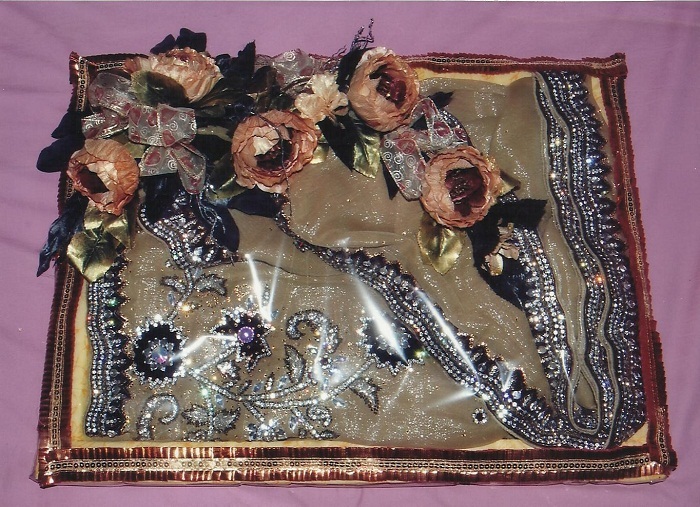 Beads, Swarovski, pearls, and other jewels are used decoratively on these trays. Thus you need not do anything but place your saree over this pleasant-looking large tray. Cellophane shiny wraps and golden glimmering ribbons are the next step for decoration if you want your decoration to turn up more brighter and beautiful. After placing your saree over a life size tray (or any size that suits you) wrap it up with shiny cellophane wraps available in market. Also, you may wrap the tray with golden gotta ribbons that are also easily available at decoration shops. Additionally, you can place matching jewellery like earrings and bangles with the saree. At baby showers the decoration with dolls is the best option. You can take a sweet doll/toy from the market or from your home itself. 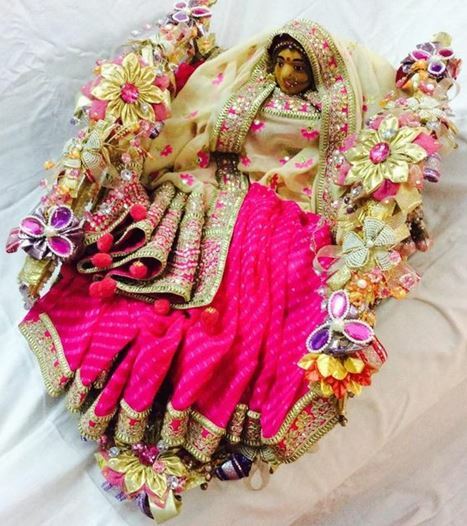 After you are done with your DIY wrap of the saree, decorate it up with a doll in the middle of that wrap (as you can see in the picture). Drape the doll with this saree nicely and neatly if you hope to see your saree decorated in a different and innovative way. Gottapatti, the traditional art form of Rajasthan has managed it place in wraps and covers too, along with suits and sarees. Instead of that good old silk pouch that you use in wrapping a saree, try a tissue fabric or georgette fabric pouch with intricate gotta-patti work done over it. Pouches with colourful and innovative designs are available in market freely. You may also look for beads’ work in the pouches. 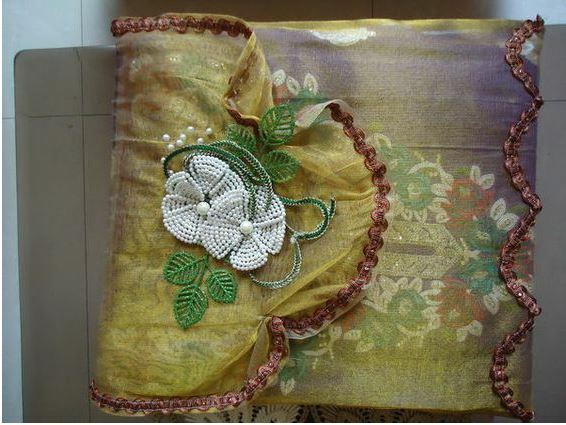 For wrapping and decorating your saree you may use assorted decorative pieces like bows, flowers, jewels, et al. This is a simple but an effective DIY since you need not do much labour but you will get interesting and satisfactory output. All you need to do is wrap the plastic wrapped saree with decorative ribbons and paste trousseau flowers (see the picture). How to Wear Half Saree in South Indian Style? How to Wear Kachche Saree? How to Wear Saree for Varamahalakshmi Pooja? How to Make Saree Pallu Kuchu? How to Wear Saree in Bengali Style? How to Wear Saree in Kerala Style? Copyright © 2019 Saree Guide.